We all know that women’s sports don’t get nearly enough attention from the media, or from the general public (or maybe we don’t all know, because it’s so absent from coverage that we don’t even stop to think about it). Why is this? I’m not going to try and answer that question, but it’s food for thought on this Labor Day Monday. While most of you probably aren’t working, I thought Labor Day’s Power Monday would be the perfect opportunity to celebrate an EDF that just doesn’t stop working. She’s like the Energizer bunny, maybe mixed with a rock ’em-sock ’em. 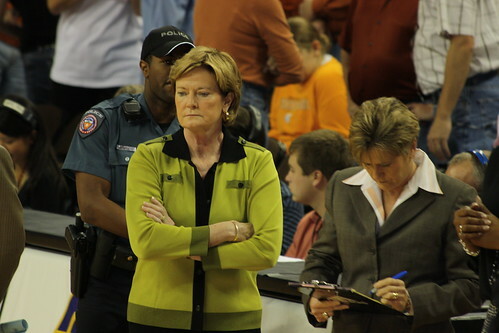 Pat Summitt is the head coach of University of Tennessee’s women’s basketball team, and she is this week’s Power Monday EDF. She has two dogs, Sally Sue and Sadie. She’s “just Pat” to all her athletes. She never missed a day of school from kindergarten through high school. There are two basketball courts and a gym named for her. She’s behind only one coach (UCLA’s John Wooden) for most NCAA Championship titles. In 2003 she was appointed for a spot on the Board of the Smithsonian National Museum of American History. In 2007 she was named one of “America’s Best Leaders” by U.S. News & World Report. She’s involved in numerous charities, including (but probably not limited to) United Way, The Race for the Cure, Juvenile Diabetes, Big Brothers/Big Sisters and the Tennessee Easter Seal Society. She was co-captain of the 1976 U.S. Olympic team (which took home the silver medal). Her son Tyler hopes to follow in her footsteps. Cool!